A bitterly cold morning saw a small field for the February race. We welcomed four generations of Ellicocks including two new runners: Jack’s grandson, Mike and future grandson-in-law, Ian. 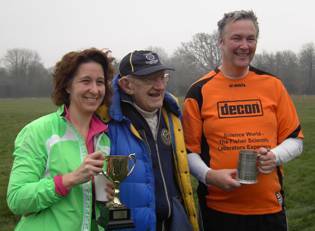 Kerry Loon and Ian Beveridge both broke their handicaps and retained their titles as Most Improved Woman and Man. Mike Ellicock ran an excellent race and finished in a new course record time. Well done to all concerned. Thanks very much to Maggie, Mike Benyon and Jack for marshalling, to Jim for the cake, to Fiona for the signs and to the Cricket Club for the lovely venue. We look forward to seeing you at the next race on Sunday 11 March starting at 10am at the Cricket Ground. Runners of all standards are welcome as are brisk walkers. It is a handicap race so the slowest have as much chance of winning the cups as the fastest. Supporters of all ages are very welcome. And here's a thought ... You may have heard that Ian is getting together a team or teams for a 24 hour relay on 30 June at Wasing Park near Aldermaston. Runners take it in turns to do five mile laps. The rest of the time you can eat, sleep, camp and generally relax. If you'd like to find out more please email Ian There's more information about the race here.